Your toilets and their cleanliness can say a lot about you to your house guests or really anyone who might be needing to use your facilities. If the toilet bowl is as clean as a whistle, it means you are a stable, healthy, put-together individual. If there are hard water stains, or rust, along the edges, it means you are hopelessly, cluelessly lost on a good day, and a barbaric savage on a bad one. While these above descriptions are certainly a bit over the top, there is some truth to how people perceive you in relation to your home’s cleanliness. Perhaps there isn’t a more concentrated area of potential-bogey appliances in your home than your bathroom. If your sink, tub, or toilet is not looking up to snuff, be prepared to be judged by the neat-freaks among us. Heck, we might even argue that you might judge yourself just a smidge, should you repeatedly be faced with a rust ring around your toilet or in your bathtub. At the very least, it’s not a desirable feeling, to be reminded that your bathroom (and therefore, your life) is out of whack, requiring significant maintenance. Maybe you are fine with a messy bathroom, and really, that’s not our business. We are simply making the point that to have a dirty bathroom leaves you open to all kinds of societal judgments. Again, it’s not our business to tell you how to behave in your own home, we just want what is best for our customers, and what we know best, on a professional level, has to do with what goes on in the bathroom. That being said, if you are interested in dusting yourself off a bit, taking a cold-hard look in the mirror, and then finally getting around to cleaning that toilet that has had a hard water stain around its bowl for the better part of 2018, we can help. We here at Bears Family PHC (that’s Plumbing, Heating, & Cooling) are happy to provide our customers and readers with some helpful industry knowledge. Keep reading if you are interested in learning what causes rust in the restroom in addition to some helpful cleaning solutions you can get excited about! Are you excited to clean up your act and your toilet with the help of Bears PHC of Loveland? We are! Let’s get to it. Here’s a novel concept: the rust around your toilet bowl, in your sink, or in your tub is likely coming from rust in the water. This is disconcerting for most folks, even if you get your drinking water from a refrigerator’s water filter. Most people use water to rinse out their mouth, and some guests don’t care about using filtered water over the tap because they think it will “boost their immune system.” Yes, we all have a crazy uncle who spouts nonsense during the holidays, but that doesn’t mean you should subject them to drinking rust-water. If you do end up having rust-water, it might be happening because your pipes and water heater are old. If so, that means you can solve the problem inside your home. If, conversely, the issue is the result of a public water issue, that’s an entirely different can of worms we will not be covering in this blog post. But before you throw your smartphone against the wall and begin weeping in anguish because this is a problem that is seemingly too difficult to surmount, we at Bears Family PHC have a few tips to aid your diagnosis. Keep in mind, however, that if you really aren’t in the mood to do a little homeowning-detective work, you can just give your local Loveland plumber a call and we will handle the entire process for you, from diagnosis to estimate to solution/repair. If there is a high-percentage of rust in your water, you won’t need a plumber’s seasoned eye or a science experiment to inform you that you’ve got a problem. You’ll be able to notice the unique, metallic red-brown hue that rusty water so graciously offers. But before you panic as you rewind your entire life, scouring your memories for times you may have inadvertently ingested rusty water, you should feel some degree of comfort in the fact that rust particles aren’t technically a threat to your health. Because rust is simply oxidized iron, the vast majority of people won’t have any adverse issues upon drinking a little bit of water. The exception to this matter is found in those diagnosed with a disorder called hemochromatosis, which doesn’t sound fun. Regardless, simply because something isn’t toxic doesn’t mean it’s a great idea to start guzzling down pints of it on the regular. Let’s analyze where this problem is coming from and what you can do about it. Again, you don’t need a local plumber to get to the bottom of this issue. To figure out whether your home or the public water supply is the culprit, get a cup and fill it with only cold water from the suspect fixture. Inspect the water; smell it for odor and look at it for the bogey-hue of red and brown. Then run the hot water and fill up your glass. Here’s how you tell the difference: if there only is rust in your hot water supply, or even if it goes away after a few seconds of running, the problem is likely restricted to the confines of your home. If, however, you have rusty water coming from hot and cold water samples, get in touch with your public utilities provider immediately to inform them of the issue. And tell them Bears BHC told ya if they give you any attitude. What’s more, there is additional evidence to be gleaned from this little experiment. If rusty water came from the cold water tap, it means you likely have a pipe that is corroding in your plumbing system. If it’s exclusively a hot water issue, it’s more than likely a water heater problem. Either way, you are one step closer to solving the problem, even if it takes an affordable plumber to do it. 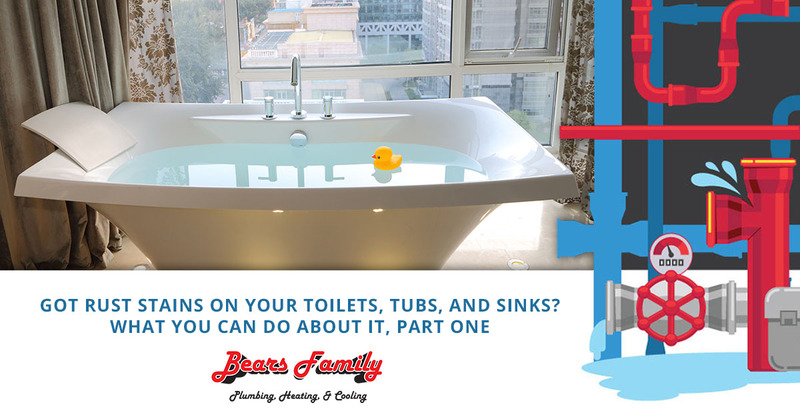 Bears Plumbing, Heating, & Cooling is your one-stop-shop for plumbing, HVAC service, and more. For folks in Loveland, Denver, Fort Collins, and up and down the Northern Colorado Front Range, we’ve got you covered with affordable prices and reliable plumbing service. We’ve got over 15 years of experience offering AC repairs, hot water heater installations, and general HVAC maintenance. We make a point to blend value with quality here at Bears PHC, so if you have any plumbing or HVAC needs that you wish could be accomplished but might not have the budget for at the moment, we have financing options available. Be sure to ask us about those when you call in. In the meantime, look out for part two of this two-part series dealing with rust in the water, tub, sink, and around your toilet bowl. In our follow-up piece, we’ll take a look at what homeowners can do about rusty water. We hope you’ve enjoyed part one, and feel inspired to clean your toilet. If you aren’t quite there yet, all we can say is look out for part two! Reach out to us today for all plumbing and HVAC service!